Princes Street 1-way bike ban? Radical council proposals for the future of Princes Street and George Street appear to include a ban on cycling eastbound in Princes Street. With tram works and tram funding now under control after the previous years of chaos, the new Council is now responding to longstanding lobbying by Spokes* and others, with radical proposals for the city centre [pdf 1.3MB]. *For example 2010 – Spokes 107; 2011 – news item; 2012 – Spokes 114; 2013 – news item. Whilst the Council’s overall vision, and its intent to act quickly, are a welcome breath of fresh air, the proposals for Princes Street are a real blow for cycling. They are completely at odds with the Council’s own Jan Gehl report [below] – which is supposed to form the basis of the new plans – and they are totally inconsistent with the council’s avowed intention to raise cycle use to 10% of all journeys (and 15% of commuter journeys) by 2020. European cities which have raised cycle use have not done so by banning bicycles from premier streets, but by making them permeable, and with well-designed cycle routes which deter speeding in busy areas. Under the proposals, westbound cycling will still be allowed in the bus and taxi traffic lane (as now) but eastbound cycling will be entirely banned. The council’s idea is that all eastbound cyclists will be diverted away from Princes Street to a high-quality but round-about route along George Street, then back again at the far end of Princes Street. In Princes Street and George Street, the north-side carriageways will be closed to traffic, with widened pavements to allow for cafes and pavement activities. In George Street, but not Princes Street, a two-way cycleroute will also be provided. Buses and taxis will travel west in Princes Street, with buses, taxis and cars eastbound in George Street. The George Street middle-of-the-road car park will remain. The Gehl report, which the Council commissioned, and which is extensively referred to in the council proposals, emphasises the importance and feasibility of safe cycling in Princes Street. Chap 6 p221 ‘Princes Street Rediscovered’ – artistic impression with walk, cycle and taxi. David Sim, Gehl’s representative on the Edinburgh project, told the newspapers there should be ‘more cyclists’ on Princes Street. Inexplicably, ever since the Gehl report was published early in 2011, Jan Gehl’s vision for Princes Street has been modified by council officials to downplay the potential of cycling. Whilst the new proposals are the most extreme example, the same approach was apparent in earlier council reports. This was already highlighted in a Spokes briefing to councillors back in 2011, and raised at Committee by Cllr Burgess, as a result of which the Head of Planning told councillors ‘it is not the intention that cycle lanes are squeezed out but are part of the solution’. A promise which again appears to have been forgotten. It is important to note that the council is not a monolith. There are a variety of opinions amongst officers and councillors and any decision, such as this downplaying of cycling, may reflect who had the final say or who wielded the biggest baton. Pressure from outside can help redress the balance. A 2-way cycleroute is being provided in the traffic-free north side of George Street. The same should happen in Princes Street. Careful design, perhaps 2-3cm below the pavement level, and with similar high quality paving, should provide a solution acceptable to ‘streetscape’ visual requirements. Use of paving and appearance would keep speeds to an appropriate level if this is a concern. Princes Street worked well even with totally unrestricted cycling in 2011 when the street was completely traffic-free during a one-month break in tram works. See our pictures which show a very positive-looking integration of cycling, rather in the manner suggested by the Gehl report. Spokes supports the proposed George Street 2-way cycleroute, which will certainly help many people. However, for many other west to east trips this is not a sensible alternative, being a detour requiring 2 or more left and right turns at each end (junctions are cyclist danger points) as well as the road crossings along George Street. Returning to Princes Street will involve the same tramline crossing as now. It is difficult to see how a cycle-friendly connection back to Princes Street and the Bridges would be possible, and this is not shown even in outline in the council proposal. What will happen for eastbound emergency vehicles and for night-time shop deliveries? If they need access, the route could be combined with the cycling facility, presumably via a strengthened paved section. George Street is increasingly being closed to traffic during festivals – for example this is likely to happen for the whole of August this year. What happens if cycling is also banned on Princes Street? Some officers and councillors have claimed their proposals will reduce tramline crashes and injuries. This is not mentioned in the report, but we have heard it mentioned several times. We believe this to be a seriously misplaced view. Most crashes involve traffic pressures. A cyclist travelling parallel to the lines is forced sideways into the lines, or a cyclist wishing to cross the lines is unable to position themself safely. Such crashes will be avoided. Most tramline crossings by cyclists are at the ends of Princes Street. Most cyclists using George Street as an alternative to Princes Street will still need to cross the tramlines to get to or to return from George Street. On a cycleroute in a paved area people will be cycling considerably slower than many do on the present vehicle carriageway, thus avoiding many crashes. Any remaining cycleroute-related tramline crashes are likely to be less serious than now. The cyclist will be travelling slower and also will not feel pressurised into a dangerous last-minute forceful manoeuvre by the fear of being run over. Indeed a 2-way cycleroute could well reduce total tramline crashes and injuries by providing a safer environment for the 50% of bike journeys which the council’s current proposals will retain on the westbound carriageway. 1. The proposals are expected to go out for public consultation in the coming weeks, but if they concern you, please contact your own councillors now. We cannot expect councillors to come up with precise details yet, but you can ask for an assurance that any redesign of Princes Street will include safe eastbound and westbound cycling. 2. Our petition for a traffic-free Princes Street also remains. Please sign if you’ve not yet done so! We will use it to highlight the above case when we speak to the Council Petitions Committee in a few weeks time. 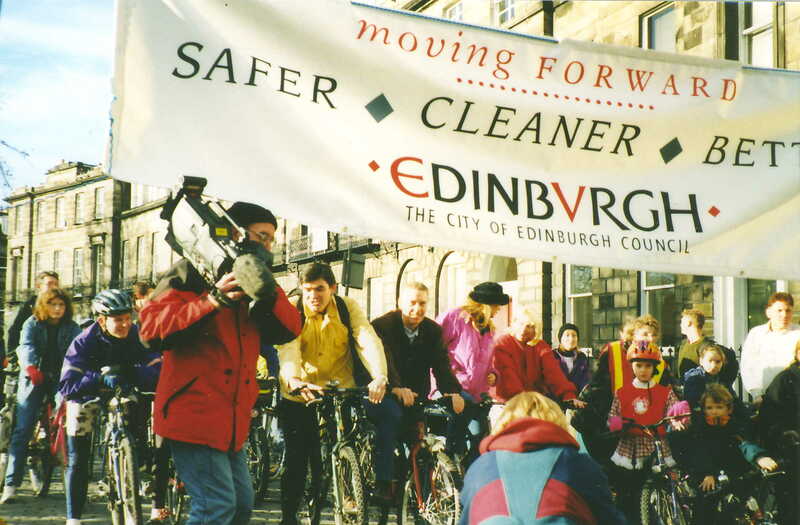 The Princes Street cycle lane [now removed] is opened on 17 November 1996 by City Council Transport Convener Cllr David Begg, accompanied by 3 other councillors, 4 senior officers and a proud Council banner! A bit more history on our Princes Street page. 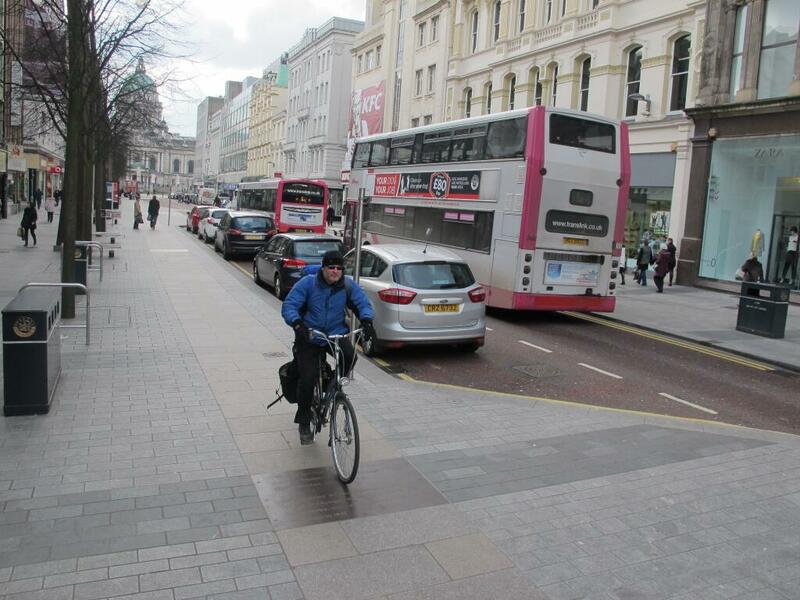 In response to our above article, Steven Patterson of Sustrans Belfast tweeted, “Belfast main shopping street widened pavements, banned cycling 1 direction. Now have illegal pavement cycling!” He sent us a picture too (and he confirms that the distinctly-paved strip on which the cyclist is riding is part of the landscaping, not a cycle lane).